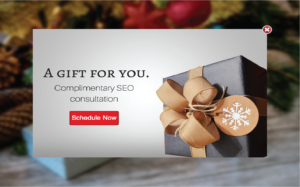 ﻿ 5 Exit-Intent Holiday Campaign Ideas to Boost Conversions » Red Mango Marketing! Are you tired of using the same old marketing tricks to generate more sales during the holiday season? Then you might want to give exit-intent technology a try. econd chance to connect with the visitors and convert them into a lead or even a customer. According to Beeketing, exit-intent popups help businesses convert 35% of their abandoning visitors into leads. That’s why Constant Contact has introduced its new pop-up forms feature to help you both capture web visitor attention and generate more potential sales. he technology helps predict when a visitor is about to leave your website and show the pop-up message as a last attempt to get them to convert into a subscriber. Exit-intent popups have been proven effective for many reasons. Studies show that they help improve website conversions by 10-15%. This is because they allow you to show non-intrusive pop-up messages without interfering with the user experience. 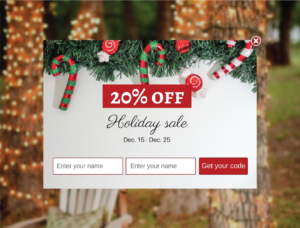 Here are a few ways you can use this technology to your advantage to boost conversions this holiday season. holidays when almost all businesses are launching sales with big discounts. this same strategy to convince your visitors to stay on your website by setting up an exit-intent popup with a discount or a coupon code. an still offer a discount on your subscription to attract more people to buy your service or gift it to a friend. Setting up an exit-intent popup with a countdown can create a sense of urgency. This helps remind your visitors that time is limited to get started on their holiday shopping before it’s too late. Studies show that creating a sense of urgency can boost sales by 332%. And it works for growing your email list as well. 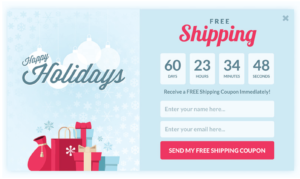 These popups can also be used to promote your special holiday sales by combining a discount or a coupon code with the countdown timer. With all the competition nowadays, it seems like it’s getting harder and harder to stand out and get demos for our services or technology. So, we just have to up our game.Present your demo (and time) as the gift it is this holiday season to make buyers think differently. After all, the greatest gift we can give is our time. hem to a screen where they can automatically select the best time that works for them. One of the most intuitive tools for scheduling is called Calendly if you’re interested to check it out. There are a lot of sales and offers during the holiday season. The thing is, no matter how attractive the offer, people can’t afford to buy everything that comes with a discount or a sale. Therefore, it’s always best to give a preview of your product to let the user decide whether or not it is worth buying. For example, you can start building up an impressive email list by sending customers free recipes and capturing the email leads right before they leave your site. Then, when you’re ready to write that cookbook, you’ll have a highly-targeted email list of people who recognize you and will be more likely to convert to a paying customer. 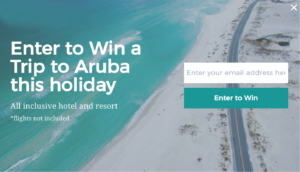 If you’re trying to get the most conversions from your visitors, contests are a great way to build up a targeted email list. If you don’t want to manually keep track of the emails for the contest, you can also create one button that links to your Rafflecopter campaign. These are only a few of the strategies you can use to create exit-intent popups. Put your imagination to work, and see if you can come up with unique ideas to offer something special to your visitors that they simply can’t refuse. So, which strategy would you use to double your conversions and make the most of this holiday season? Let us know in the comment section below! 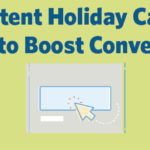 The post 5 Exit-Intent Holiday Campaign Ideas to Boost Conversions appeared first on Constant Contact Blogs. This entry was posted on Monday, November 20th, 2017 at 8:00 am	and is filed under News & Updates, Online Marketing. You can follow any responses to this entry through the RSS 2.0 feed. Both comments and pings are currently closed.